Why do we use Food Vacuum Sealer? 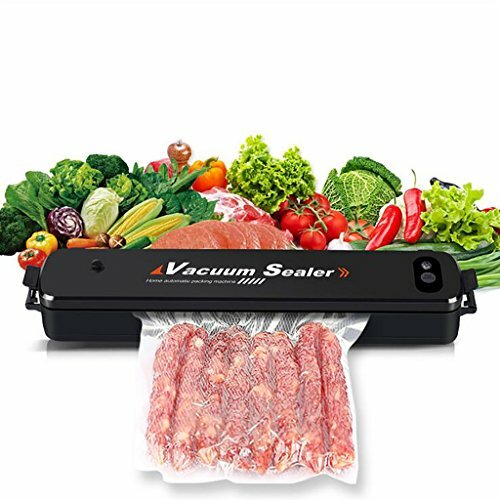 Food Vacuum Sealer ensures 8 times longer storage for food with only simple one-touch vacuum sealing. Ideal food saver for vegetables, meat, fruits, marinated food, keep food away from nasty bugs and bacteria. Dimensions: 37 * 7 * 5.2 cm. Use professional seal bags for vacuum sealers, width under 25cm. Slightly press or firmly hold is better when sealing. 8 Times Longer Storage - vacuum sealer makes food storage convenient and longer, keep food away from nasty bugs and bacteria. Ideal food saver for vegetables, meat, fruits, marinated food. Multiple Function: perfect for both vacuum and seal. Short press to Vacuum & Seal, 3 seconds' long press to Seal Only. The vacuum sealed Ingredients can be locked in all the great flavors and the nutrition. Low & Safe Sound: advanced noise reduction technology, no worries about noise and safety. Compatible with bag with folded sides and bags with lines. Also can be used to pack important documents, jewelry, or other objects for protection. Easy cleaning: Vacuum sealer are easy to clean with ABS material and special design. Perfect for food storage both home and outdoors. CE approved product. 24-hour friendly customer service and technical support. If you have any questions, we are always at your disposal! If you have any questions about this product by HSTV, contact us by completing and submitting the form below. If you are looking for a specif part number, please include it with your message.